This postcard shows the familiar home on 7th Avenue in Rock Island that was the home of one of the most prominent business women in Rock Island history, Minnie Potter. Minnie was only 32 and a mother of 3 when her husband, J.W. Potter died in 1898. When the Potter family sold the house in 1983, they found many of these postcards, indicating that they were published especially for Mrs. Potter. As Minnie Potter became successful, she desired a new home for herself and her children. She retained Rock Island architect, George Stauduhar to design this home, which was built in 1907. Mr. Stauduhar’s residential designs were generally classical in style softened by romantic details like columns, stained and leaded glass and variation in textures. This home is classic Stauduhar. The architectural style is Colonial Revival blended with stylistic details from the Prairie style. The front façade is primarily Colonial Revival with central positioning of the front entrance with side lights and elliptical fan light above. Symmetrically placed windows are typical of the Prairie style as are windows with a single lower pane topped with multiple decorative panes above. The surface treatment of the exterior is rough textured stucco on the lower portion with smoother stucco at the top. Interior features of the home carried through the romantic themes: embossed leather-look wall coverings in the formal entryway, a magnificent central staircase, mahogany paneling, stained glass, a third floor ballroom and six fireplaces. 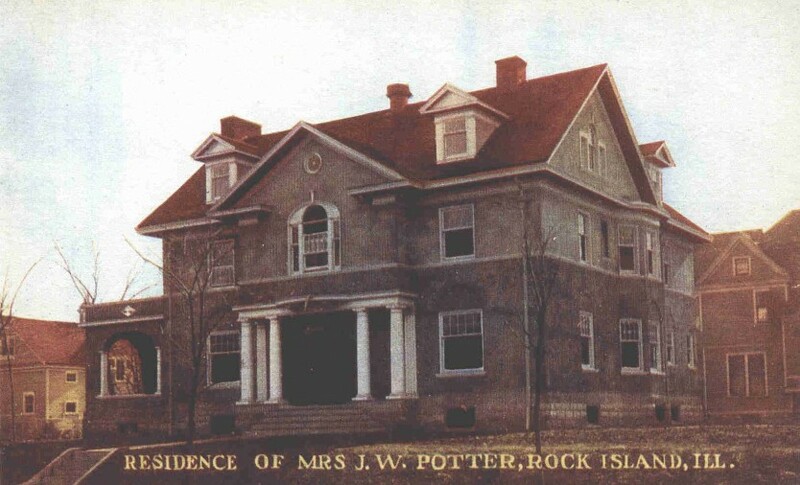 This home is not the only significant structure in Rock Island associated with Mrs. Potter. In 1925, she directed Rock Island architects Cervin & Horn in the design and construction of a new newspaper plant at 1724 4th Avenue as the headquarters for the Rock Island Argus. The dramatic building remains today, largely unchanged, but with new uses. Mrs. Potter never remarried. She remained president of the newspaper and lived in this house until her death in 1936. Her family retained ownership of the home, with daughter Marguerite living here, until 1983. Since that time, the home has been carefully restored, was used for a time as a bed and breakfast. Today it is once again a single family home. In 1987,the Potter House was designated a Rock Island local landmark. This designation is possible because Rock Island has a preservation ordinance. Under this ordinance a building in the city which is over 50 years old may be designated for its architecture, association with an important person or event, association with an influential architect or builder or because of its value as part of our historic, cultural or ethnic heritage. Historic neighborhoods can also be designated under the same ordinance. Once designated a landmark, a building is afforded protection from exterior changes that would change its distinctive visual characteristics. Exterior changes require a certificate of appropriateness from the Preservation Commission. The Commission has developed design guidelines that support property owners as they work to restore or preserve their historic structure. Why become a landmark? Although there can be some financial benefits if the landmark is used commercially, often it is simply pride in their historic building that leads owners to request that designation. And there is also evidence that preservation or restoration actually adds value to all historic buildings. This can be particularly true in a historic district where all the structures are being preserved and the sense of time and place is being maintained. Even more important, preserving buildings preserves our history. Rock Island has a very rich history and our buildings are real and touchable pieces of that history. The Potter House is a perfect example. It is a Colonial Revival home that showcases the design characteristics of a prominent Rock Island architect. And it embodies the story of Minnie Potter and her family and their contributions to our community, both through the building of a beautiful family home and the lasting legacy of the Rock Island Argus. This article by Linda Anderson is slightly modified from the original, which appeared in the Rock Island Argus and Moline Dispatch on March 20, 2005.